The hosts of Lone Star Politics, NBC 5 political reporter Julie Fine and The Dallas Morning News political writer Gromer Jeffers, moderated the evening. 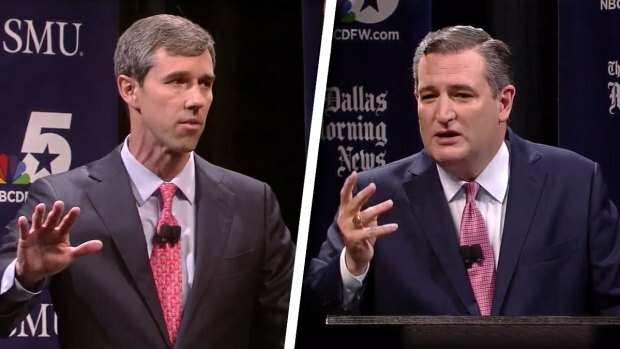 U.S. Sen. Ted Cruz and U.S. Rep. Beto O'Rourke squared-off in the first of three debates ahead of the November election. The debate's moderators, NBC 5's Julie Fine and Gromer Jeffers of The Dallas Morning News, shared their thoughts about the evening. There were no restrictions on topics. The race is drawing national attention and recent polls show it is close. A Texas NBC News-Marist poll of registered voters showed O’Rourke trailing by 4 points, with 45 percent of the vote, to Cruz’s 49 percent. Cruz was elected to the Senate in 2012, and ran for President in 2016. O’Rourke was elected to serve El Paso in 2012. 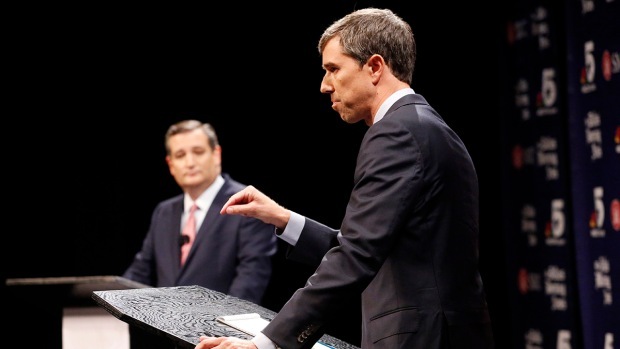 U.S. Sen. Ted Cruz and U.S. Rep. Beto O'Rourke squared-off in the first of three debates ahead of the November election. Highlights from the debate, as well as video clips of each question, can be seen below. 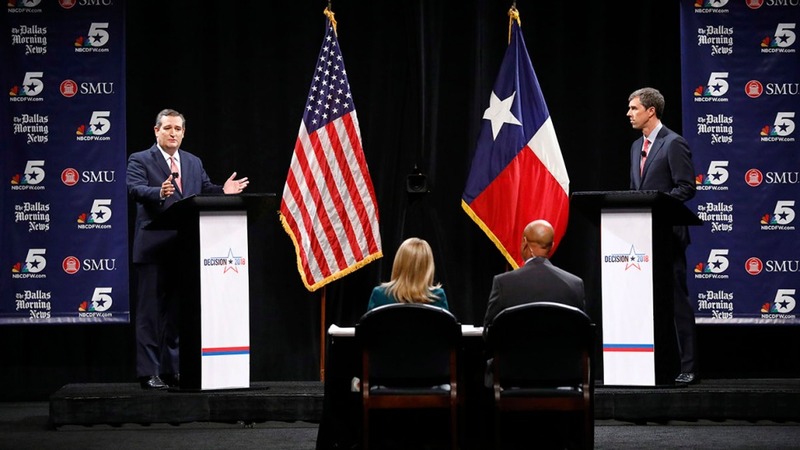 The first question of the debate centered around immigration and the Texas border. "There is no better people than those of us here in the state, Republicans and Democrats, Independents alike, the defining border experience, the defining immigrant experience and state to rewrite our immigration laws in our own image," said U.S. Rep. Beto O'Rourke (D-El Paso). "When it comes to immigration, we need to do everything humanly possible to secure the border. That means building a wall, that means technology, infrastructure, that means boots on the ground, and we can do all of that at the same time that we are welcoming and celebrating legal immigrants," said U.S. Sen. Ted Cruz (R-TX). The second question to the candidates addressed the recent shooting death of Botham Jean by off-duty Dallas police officer Amber Guyger. "What happened to Mr. Jean was horrific. Nobody should be in their own home and be shot and killed in their own home," Cruz said. "With the tragic shooting death of Botham Jean, you have another unarmed black man killed in this country by law enforcement. Now, no member of law enforcement wants that to happen. No member of this community wants that to happen, but we've got to be doing something better than what we've been doing so far," O'Rourke said. The third question to the candidates addressed the National Anthem kneeling controversy. "There are too many unarmed African American men loosing their lives in this country. To peacefully protest that injustice, non-violently and to call attention to that, to prick the conscious of this country, so that those in positions of public trust will finally do something. Standing up not just for your rights but for everyone's rights in this country, there's nothing more American than that," said U.S. Rep. Beto O'Rourke (D-El Paso). "When you have people during the National Anthem taking a knee, refusing to stand for the National Anthem, you are disrespecting the millions of veterans, the millions of soldiers and sailors and airmen and marines that risk and fight and die to protect that flag and to protect out liberty," said U.S. Sen. Ted Cruz (R-TX). The candidates addressed the National Anthem kneeling controversy. The fourth question the candidates fielded addressed the debate over the confirmation hearing of Judge Brett Kavanaugh to the U.S. Supreme Court. "Congressman O'Rourke doesn't want Judge Kavanaugh confirmed. He said that before these allegations, he said that after these allegations. He didn't want Neil Gorsuch confirmed. Congressman O'Rourke agrees with Hilary Clinton. He wants liberal judicial activists on the court, who will impose their particular policy view," said U.S. Sen. Ted Cruz (R-TX). The fifth question to the candidates addressed the debate over gun control. "Thoughts and prayers, Senator Cruz are just not going to cut it anymore, the people of Texas, the children of Texas deserve action," said U.S. Rep. Beto O'Rourke (D-El Paso). The candidates addressed the debate over gun control. The sixth question asked of the candidates addressed Cruz's relationship with President Donald Trump. "I've got a responsibility, which is to fight for every person here and every person in this state. So, I have worked hand in hand with the president on substance and we have delivered remarkable victories," said U.S. Sen. Ted Cruz (R-TX). "If the president attacks you personally, your wife, your father, how you respond is your business. But when the president attacks our institutions, this country, allows a foreign power to invade our democracy, that is our business," said U.S. Rep. Beto O'Rourke (D-El Paso). The seventh question to the candidates addressed drunk driving. "If my experience can contribute to an understanding that allows me to work with Republicans and Democrats alike on real and meaningful criminal justice reform to ensure that everyone is able to live to their full potential and that no one's mistake defines them for the rest of their lives, that would be something good in whatever meaningful way it is that have come out of that terrible decision on my part," said U.S. Rep. Beto O'Rourke (D-El Paso). "Legalizing marijuana is actually a question where I think reasonable minds can differ, I've always had a libertarian bend myself, I think it ought to be up to the states, I think Colorado can decide one way and Texas can decide another," said U.S. Sen. Ted Cruz (R-TX). The eighth question asked of the candidates addressed their views on healthcare in the United States. "The biggest reason people are unhappy with Obamacare is it's made their premiums skyrocket. I hear from Texans all over this state, 'I can't afford health insurance,'" said U.S. Sen. Ted Cruz (R-TX). "I don't know how you're going to repeal every single word of the Affordable Care Act and keep protections for preexisting conditions," said U.S. Rep. Beto O'Rourke (D-El Paso). The candidates discuss the U.S. healthcare system and the Affordable Care Act. The next topic to the candidates addressed President Trump's trade agenda. "This state, with its farming and ranching and producing, manufacturing and export based economy needs a senator who will work with the President where we can and stand up to him where we must," said U.S. Rep. Beto O'Rourke (D-El Paso). "I have made the case to President Trump directly and personally dozens of times that we should be expanding our access to foreign markets and opening up the Mexican energy markets and expanding our access to Canada," said U.S. Sen. Ted Cruz (R-TX). The candidates discuss President Donald Trump's trade agenda. The next topic to the candidates addressed Tax Overhaul. "I believe not in investing in corporations and in special interest. I believe in investing in people. In universal pre-K for every child so everyone has the same starting line in life, in healthcare, for every Texan and every American to be their best. "So understand what Beto O'Rourke is promising you. If he's elected, he will fight to raise your taxes. That is not consistent with what the people of Texas want," said U.S. Sen. Ted Cruz (R-TX). The candidates discuss their views on taxes. When it came to discussing who best represented the values of Texans, the candidates had the following to say. "As (Rep. O'Rourke) takes extreme left-wing positions; positions further to the left of Elizabeth Warren, or Bernie Sanders, or Nancy Pelosi, he gets millions of dollars," said U.S. Sen. Ted Cruz (R-TX). "In 2016, (Sen. Cruz) missed one half of the votes in the United States Senate. You tell me who can miss half the days at work and then be rehired for the same job going forward," said U.S. Rep. Beto O'Rourke (D-El Paso). In the final question of the debate, moderators asked the candidates what they admired about each other. "We may have differences of opinions on what our destination might be and how we're going to get there, but I have no question that Senator Cruz wants to do the best for America," said U.S. Rep. Beto O'Rourke (D-El Paso). "I think Congressman O'Rourke is passionate. He is energetic. He believes in what he's fighting for," said U.S. Sen. Ted Cruz (R-TX).